Seeing as a garage door system can be quite a significant investment, it only stands to reason that you'll want it to last and not break down completely after a handful of years. Well, in order to achieve that, you'll need to make sure the system and its various parts are properly cared for. That's where our professional maintenance service comes into play. As the hardware parts that support most of the weight of the door, and provide the counterbalance that assists in moving the panels, the springs need a little extra attention. They deserve it, in fact, hardworking parts that they are. Our technicians will inspect them for minor fractures and tears, lubricate their coils for optimum efficiency, and even carry out spring tension adjustment, if we find that the door is starting to lose its balance. This will help these components live up to their full potential, and extend their longevity by a significant margin. In order to make sure your door doesn't pose a threat to you or your family members, our team will test the opener's safety sensors and realign them if we find that they've lost their proper position. We'll also check to make sure the auto-reverse feature is working correctly, as this is the mechanism that forces the door to reverse when it encounters resistance. Needless to say, you want this feature to be fully functional at all times. 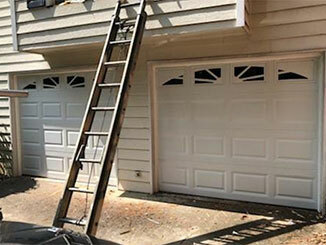 There are a lot of additional tasks that make up a garage door maintenance appointment. Checking and repairing bent tracks, lubricating the rollers and the hinges and even adjusting or replacing the cables (if they've become frayed) are all parts of this service. In addition, we will also check the condition of the exterior door panels to see if some minor repairs are in order or if certain sections need to be replaced. If you want to make sure your door, opener and all the other parts of the automatic system are in the best shape they can be, give our team at Garage Door Repair Troutdale a call today. Our maintenance service will see to it that everything from the springs to the cables is in great working order.